Budapest – 6th Annual Forum of the EU Strategy for the Danube Region was held between 18. and 19. October in Budapest, Hungary. 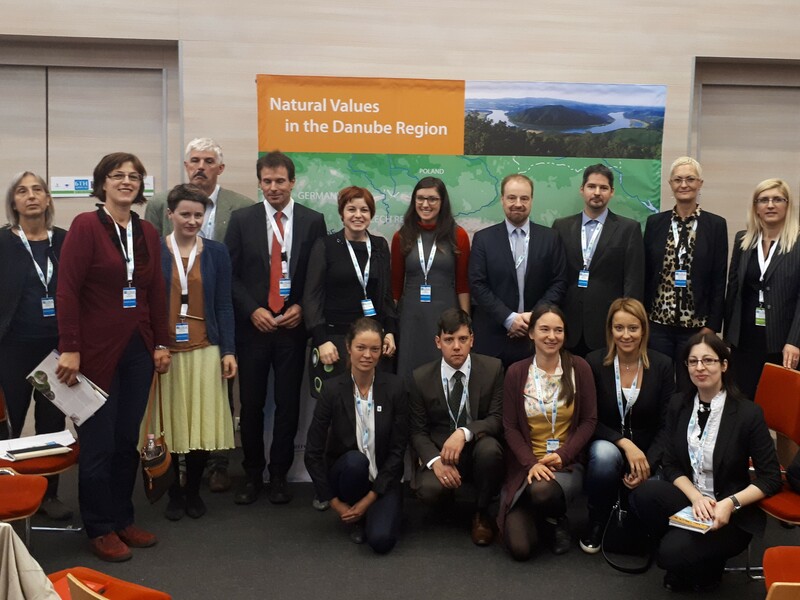 As the 5-country Biosphere Reserve “Mura, Drava and Danube” is mentioned in the Action Plan of the EU Strategy for the Danube Region (EUSDR), this was good opportunity to present coop MDD project to key stakeholders and decision-makers from the Danube region. Representatives of projects DANUBEparksCONNECTED, EcoKarst, LENA, GeoTour, and coop MDD presented main aims of their projects and involvement of stakeholder into the implementation activities. Project activities include the protection of dynamic rivers and their floodplains, analysis of ecosystem services, protection of migrating birds from collision with electricity lines, setting up of e-bike sharing systems, or improving tourism income in geoparks. The audience was very interested to hear about the projects and brought in many valuable comments and possibilities for cooperation. “Natural values provide the inspirational backbone for the EUSDR and integrate all other sectors in their work. This was the main conclusion of the capitalization session of projects focussing on natural values in the region. And although natural values provide the basis for the economy in the region and are the backbone for the Danube Region Strategy, they are not given enough attention in public discussions about the future of the region. None of the past six EUSDR conferences had nature and environmental protection as a main focus topic“, pointed out Magdalena Wagner, project manager of coop MDD. “The message from all the participants in the workshop group was clear – latest by 2019, the protection of natural values in the Danube Region needs to become the priority topic of the EUSDR Annual Forum”, concluded Wagner.